Who hunts the wild boar? 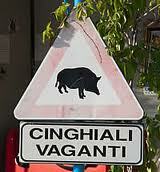 One food I enjoyed in Italy, but seldom see in America, is wild boar. When we were staying in Sulmona, our friend Cesare took us through several mountain villages to see various monasteries and hermitages connected to Pope Celestine V (the subject of my research in central Italy). We stopped for lunch in a village in the mountains of Majella National Park, and went to a restaurant called Belvedere, which hung on the edge of a precipice overlooking the wild hinterlands of Abruzzo. Vern was intrigued to find wild boar on the menu—cinghiale in Italian—and decided to try it. His curiosity was rewarded: the waiter soon delivered a huge bowl of savory chunky stew. The meat was similar to pork, and very tasty. Yes, it seems the ‘wild’ boar was raised on a farm! Quite a disappointment, as a boar hunt was fully formed in my imagination already. Truly wild boars have proliferated in some areas of rural Italy, because their natural enemy, the wolf, has declined in population. According to some sources they now produce more offspring due to mating with domesticated pigs. They damage farms and gardens, and can be a traffic hazard. My son and I found wild boar on the menu of La Dolce Vita restaurant in Seattle a couple of years ago, and like his dad, he had to try it. I don’t see it on their online menu now. I haven’t found any to try cooking myself, but I found a recipe online at http://italianfood.about.com/od/furredgameetc/r/blr1082.htm that looks pretty good. If you want to try it using pork, and just pretend it’s wild boar, go ahead—I won’t tell! This entry was posted in Food, Travel and tagged Abruzzo, cooking, food, Italy, Majella, Sulmona, travel. Bookmark the permalink.